So the much awaited Indian Railway Budget is out. It was presented by Indian Railway Minister Mr. PK Bansal in parliament today. 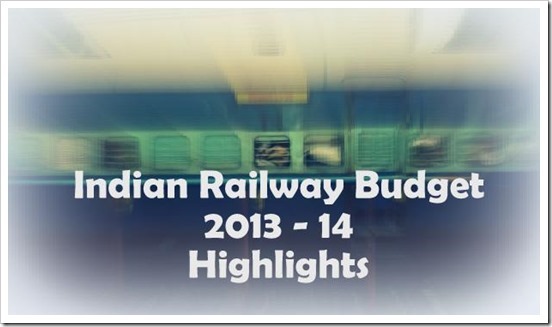 We bring you the most important updates and highlights from 2013-14 years Railway Budget. 1) While the Freight charges are going to go up by 5 percent there is no increase in passenger fares on railways. 2) However, there will be slight increase in reservation and cancellation charges of tickets. Additionally their will be extra charges for superfast trains and Tatkal bookings. 4) Nine new Electric Multiple Unit (EMU) trains to be introduced. 6) Sportsmen to get concessional fares. 8) Railways expect 12,506 crore rupees to be in balance by end of 2013-14. 11) 5 fellowship awards to be announced by Railways to motivate students. 12) 1.52 lakh vacant positions in Railways to be filled in 2013-14. Also, 47,000 vacancies for weaker and physically disabled personnel to be filled up as well. 13) Steps will be taken to connect Manipur through railway routes. 14) New Toll free number – 1800111321 has been setup to address travelers grievances. 19) Special attention will be provided to Railways stations in NCR. 23) New Indigenously developed collision avoidance system will be trialed in 2013-14 to avoid train accidents. 27) Gross Traffic Receipts – Rs. 1,43,742 crore which is an increase of 18,062 crore over previous year. 30) Provision of hostel facilities for single women railway employees at all divisional headquarters. Apart from these, the Railway minister also highlighted the fact that there is mounting scarcity of resources and thin spread of funds continue to be a problem. Also, even though the total passenger trains have increased from 8000 to over 12000 in 2012, the losses are mounting and are estimated to be approx. 24,000 crore in 2012-13. Trak is covering Railway Budget since 2009 with out a miss !! !